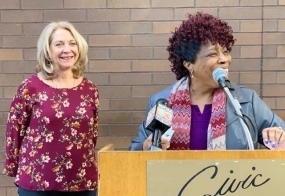 January 22, 2019 – City leaders have announced a Blue Ribbon Commission to address violence in the city. Dr. Janelle Norman of Decatur Chapter of the NAACP said the commission will look at concerns as they relate to home, schools and the community. But she stressed that more will come out of this commission than a report. The commission will see what actions can be taken from the report and put them into motion. Listen to a full podcast of the press conference.